Earlier in the day at the rally outside Gillette Stadium Tom Brady praised the Philadelphia Eagles, dropped the microphone and then walked off stage to lead the New England Patriots on the road to the Super Bowl. 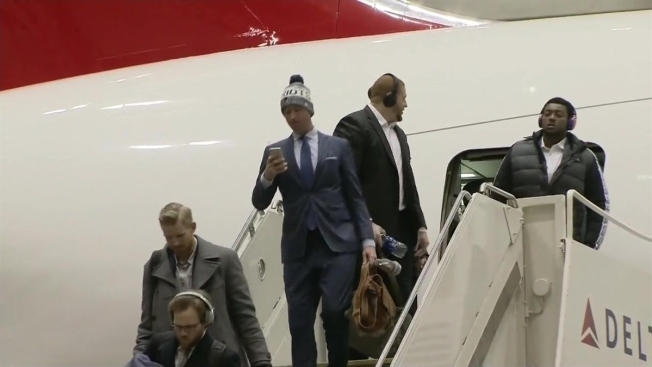 The New England Patriots landed in Minneapolis on Monday afternoon to continue their preparations for Super Bowl Lll against the Eagles on Sunday. Earlier in the day at a rally outside Gillette Stadium, quarterback Tom Brady praised the Philadelphia Eagles, dropped the microphone and then walked off stage to lead the Patriots on the road to the Super Bowl. "It's going to be fun, it's going to be a lot of hard work, we're playing a great team, but I tell you what, we've got a locker room full of guys that are ready for the challenge," the Patriots' 40-year-old quarterback said at a sendoff rally outside Gillette Stadium attended by thousands of fans, some of whom arrived in the pre-dawn hours. Brady, the last of several players to speak, praised the fans for their support all season. "We got one more to go. We're going to go out there are try to win it for you guys. We love you. Patriots out!" he shouted to raucous cheers. One fan dressed as a snowman while one wore a giant replica of a Super Bowl ring on his head. 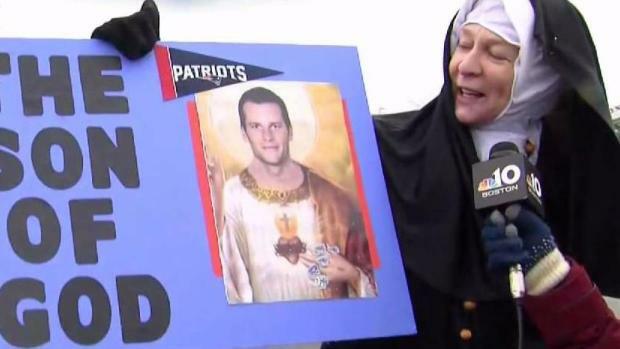 One woman carried a sign that read "Just like Tom Brady, this never gets old." After the rally, the team boarded buses for a short trip to T.F. Green Airport in Rhode Island for the flight to Minneapolis for Sunday's Super Bowl. Dozens more fans gathered at the airport to see the team board the Patriots' plane, known as Air Kraft after team owner Bob Kraft. The Boeing 767 is painted with the team's logo and its five Lombardi trophies. In Foxborough, the fans also heard from coach Bill Belichick, and several other players including receiver Danny Amendola and defensive back Duron Harmon, who prompted the crowd into chanting "MVP!" before introducing Brady. Tight end Rob Gronkowski also appeared on stage, although he didn't speak. Fans hope that he'll be able to play in the Super Bowl after suffering a concussion in the AFC championship game against the Jacksonville Jaguars. The Not Done Super Bowl LII Send-Off Rally was held at the NRG Plaza outside The Hall at Patriot Place in Foxboro, before team buses departed for T.F. Green airport in Providence for their flight to Minneapolis. 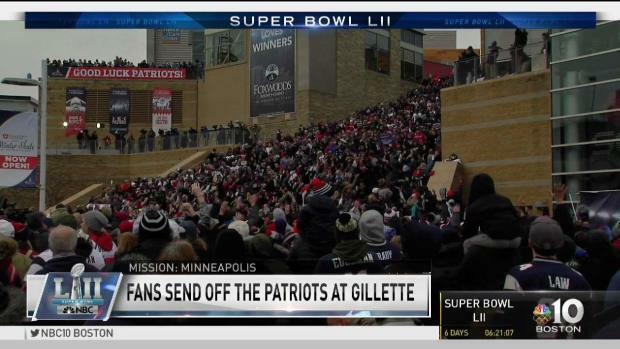 The crowd was kept entertained while waiting for the rally to start by the team's radio crew Bob Socci and Scott Zolak, as well as former player Jermaine Wiggins, a member of the 2001 championship team. Fans also shared in 16-foot-by-12-foot Boston cream pie decorated with the words "Not Done," the team's motto for this Super Bowl made by Montilio's Baking Co., and cut into 4,000 pieces.